Members of an influential family of Philadelphia painters, James Peale and his nephew Raphaelle (1774-1825) have been credited with setting a standard in still-life painting that contributed to a broader taste for this subject among American patrons during the 1820s. James began his artistic career as a portrait and miniature painter under the tutelage of his older, influential brother Charles Willson Peale (q.v.). In an effort to avoid competing with one another in a tight art market during the post-Revolution era, the brothers agreed to divide their work in portraiture: James focused on miniature painting, while Charles did larger oils on canvas. As James faced failing eyesight during the 1810s, he turned from the detailed work of miniature portraits to larger still-life and landscape subjects. 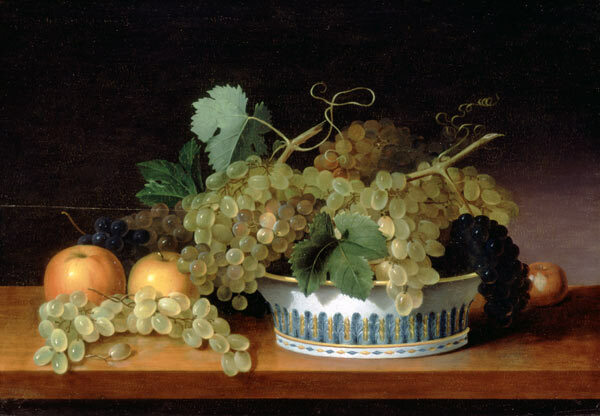 Remarkably, he was seventy-six years old when he painted this elegant arrangement of apples and grapes spilling out of a Chinese export-porcelain bowl. James clearly delighted in the variety of textures- from the smooth sheen of porcelain and mahogany to the cloudy moisture of the grapes and the serrated edges of their leaves. The illusion of reality is heightened by placement of the fruit at the edge of a tabletop as if to tempt the viewer to reach for it.